A still from the GoldieBlox advertisement that aired during the Super Bowl on Feb. 2, 2014. A rocket covered with pink toys blasts into space at the hands of an excited group of engineering-savvy young women in a new commercial that aired during the Super Bowl on Sunday (Feb. 2). 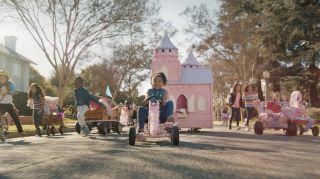 The ad for GoldieBlox — a toy company with the goal of getting girls interested in engineering — encourages young women to toss aside their usual toys in favor of building something new.